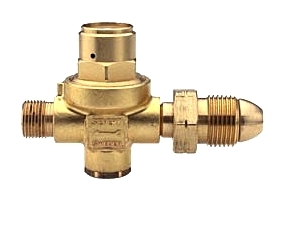 PRODUCT: SIEVERT #3091-23, 28 PSI PRESET LP PRESSURE REGULATOR, WITH POL FITTING AND 9/16-18 LEFT HAND MPT HOSE OUTLET. PRICE/EACH. STANDARD PROPANE POL FITTING ON INLET. 3/8" PROPANE HOSE FITTING ON OUTLET (9/16"-18 LH MPT). HIGH PRESSURE FIXED PRESSURE, PRESET 28 PSI LP GAS REGULATOR. NOT FOR LOW-PRESSURE EQUIPMENT. 1/4 Inch ID x 10 ft., UL listed propane hose. With two 9/16 LH FPT (9/16-18 Inch) fittings (Sievert type). Maximum working pressure 350 PSI, burst test of 1750 PSI. Price/Hose. Sievert #3486-47, Pro 86 Single Valve Gas Torch Handle. Provides flame adjustement with high quality construction. Inlet is LH 9/16 inch male thread. Price/Each.